Sign-up and receive Property Email Alerts of Residential New Developments in Claremont, Claremont. Hugon Place is set to deliver a contemporary cosmopolitan lifestyle, with the emphasis on intelligent design, comfort and technology. In an oak-lined street just a few hundred metres from the iconic Cavendish Square, Hugon Place's central location provides a wealth of lifestyle advantages to complement an address that offers outstanding mountain views. 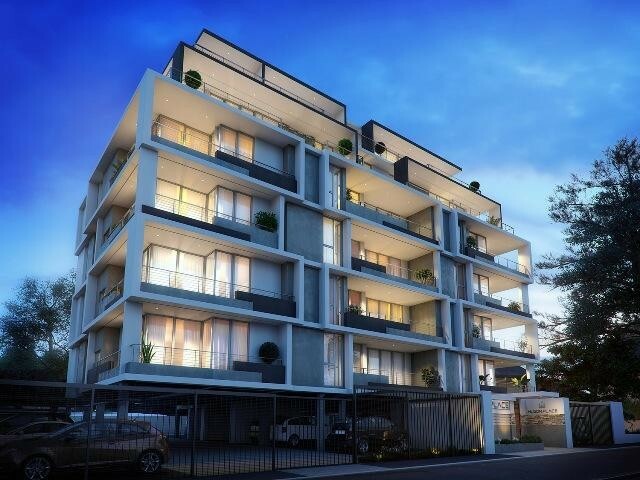 Comprising 19 apartments with one signature penthouse and now selling off-plan, Hugon Place is due for completion towards the end of 2016, presenting investors and owner-occupiers alike an outstanding real estate opportunity. - Motorized access to Cape Town's CBD as well as the Constantia Valley and the South Peninsula beaches. Each apartment is designed with capacious living, dining and kitchen spaces in close proximity to a generous, sheltered terrace, providing seamless indoor / outdoor flow. Living spaces are structured around a focal home cinema wall for flat-screen TVs. Uncompromising craftsmanship culminates in a lifestyle that is perfectly in tune with its glorious surroundings along with the spectacular mountain views. Each apartment delivers modern styling and upscale finishes setting new standards with a choice of three co-ordinated interior design palettes on offer. Hugon Place will clearly make an outstanding investment. Those that buy-to-live will enjoy the ultimate in enviable lifestyles. This prestigious address also offers convenient lock-up-and-go luxury to those who are on the move. Top-end buy-to-let investors will appreciate the superb returns that Claremont Upper apartments consistently achieve. Whether you're scaling down, looking to start a family or considering a real estate investment for your children, Hugon Place fits the bill. In an age of rising petrol prices and increasing traffic congestion, the luxury of being able to walk everywhere is not to be underestimated! Cavendish Square - just 200 metres away!